As you might have guessed from the quantity of blog posts that are already piling up here about Bali, we absolutely loved it. A LOT. And for many reasons. The one I’ll be discussing today is jamu, this traditional Indonesian medicinal drink that looks a bit like mango juice and that you might have seen popping up on several warung menus or in baskets on the head of the Jamu Gendong, these women roaming the streets selling their precious potions to the locals every morning. “Jamu” simply means medicine in Balinese and there is a jamu for pretty much any ailment, all of them made with only plants, herbs and nuts. Every Gendong has got their own spin on the recipes, adding spices and herbs as they see fit. Balinese drink their jamu daily as a health tonic, and let me tell you right now that it can be very strong tasting. I like it a lot! I think it tastes healthy. This comes from someone who loves wheatgrass and durian, so buyer beware. 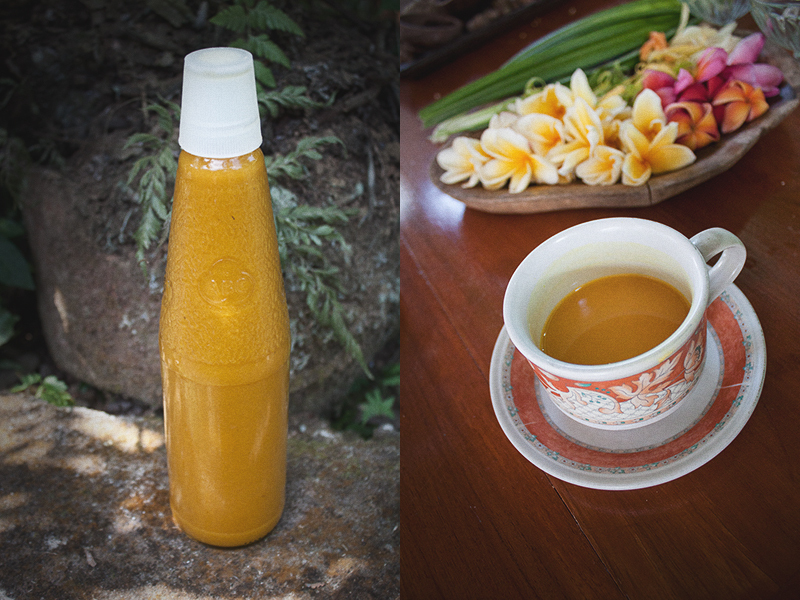 The jamu most widely available (to tourists at least) is the bright orange one made of turmeric, ginger and tamarind. It’s the only one I have tasted, but I thought jamu was such a wonderful tradition – and I am a strong believer in food and plant healing – that I wanted to find out more. 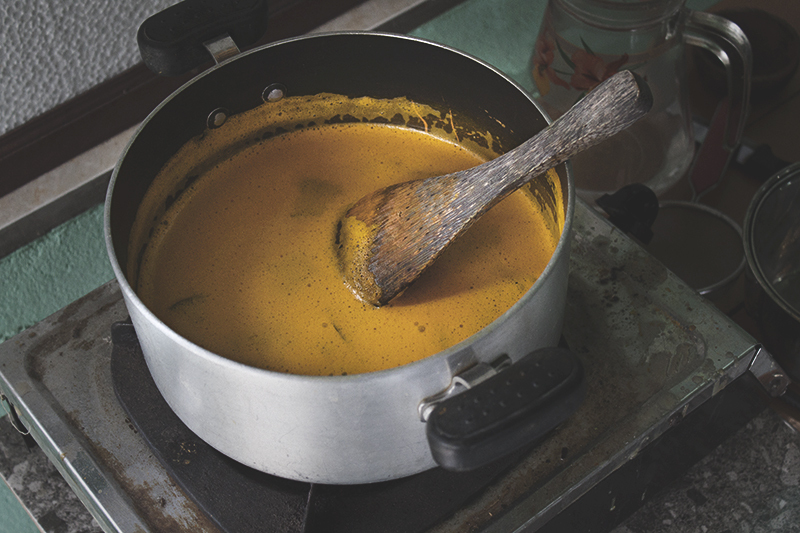 We’d used turmeric before as an anti-inflammatory to help heal sport injuries, but it’s also a strong antioxidant, liver detoxifier and kidney cleanser, it prevents cancer, arthritis and Alzheimer’s, helps with symptoms of depression and simply tastes amazing – we love Indian food! 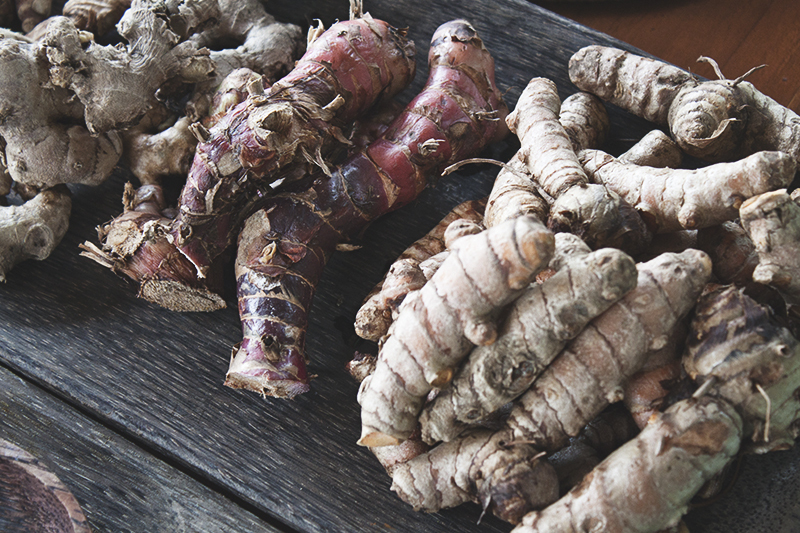 The recipe I got calls for fresh turmeric root (which looks very similar to ginger), but I realize that this might be difficult to find in some parts of the world. It might be worth asking your local Asian store for fresh or frozen turmeric, but if all else fails, powdered turmeric will do just fine. The other main ingredient in this jamu recipe is ginger, a root that is well known for its soothing effects on various stomach issues and a powerful pain reliever. 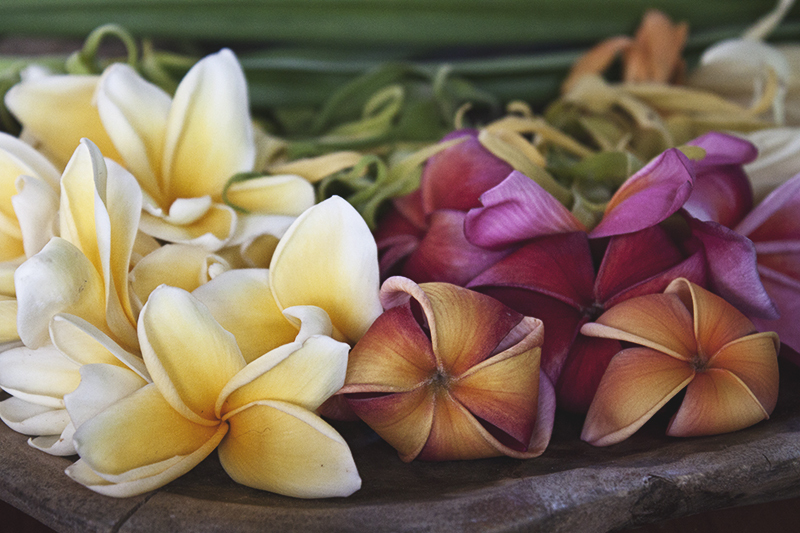 It’s easy to see how Balinese people are so fond of their jamu – it is truly a little miracle worker! 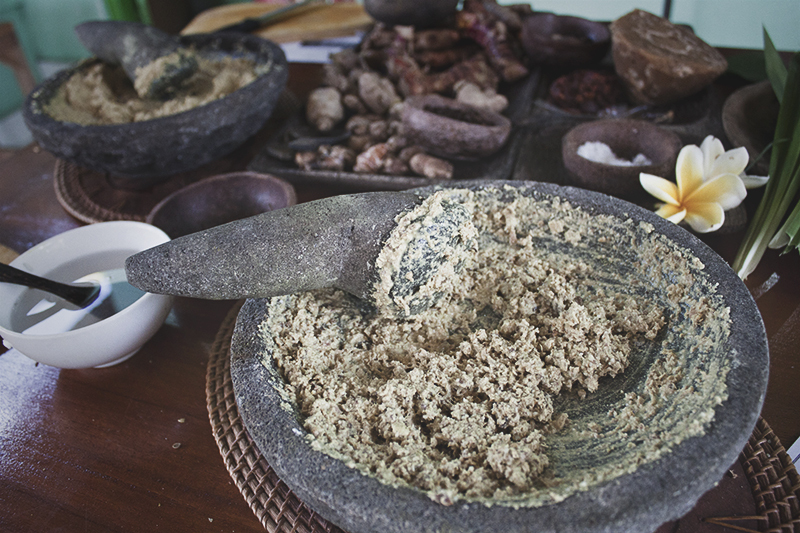 While the jamu was boilig, we prepared the boreh by pounding rice with various spices. The boreh was applied as a scrub/massage and left on as a warming poultice on the shoulders and on pressure points. Boreh was traditionally used to cure the rice field workers’ aching muscles. 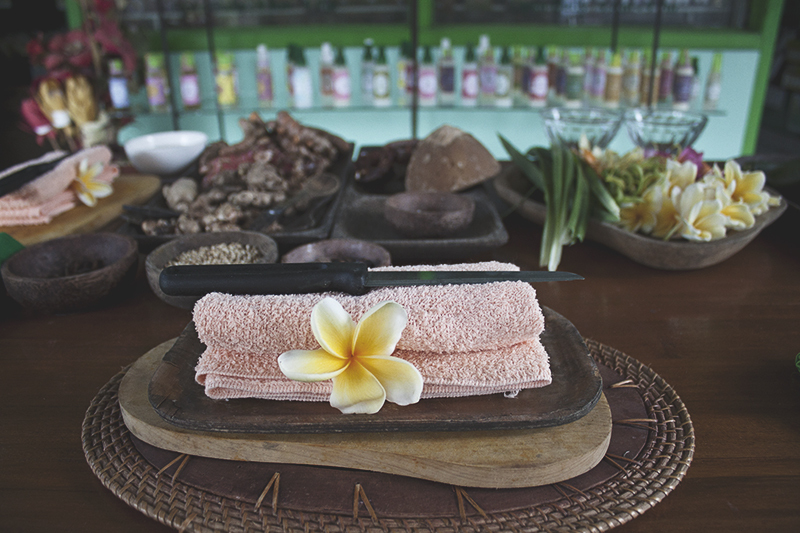 While in Ubud, I took a fascinating health and beauty workshop at Angelo Store where I learned how to make jamu, boreh (a spicy body scrub/poultice), fresh facial and body masks and a hair tonic oil – all with plants. Angelo is a little family business and all of their recipes were passed on by their grandpa who was a healer. Do check out their store whilst in Ubud, they have a fantastic range of natural cosmetic products as well as vanilla beans, herbal teas, coconut oil and obviously jamu! Here’s my interpretation of their jamu recipe (I left the exotic leaves and nuts out cause you ain’t gonna find those at Sainsbury’s). Let me know if you try it / have tried it before and what you thought! This entry was posted in Asia, Food, Healthy Living, Indonesia, Recipes on November 26, 2014 by Amélie. This looks interesting! I have a feeling I’m going to really enjoy Bali when we finally make it there. So what kind of ailments do they have jamus for? Errthing! Lol.. I think they are more like health tonics, she was telling me that there is a jamu for breastfeeding women to increase milk production, one that is good for the liver, one for cold and flu, etc…. I’m very much into that whole herb and plant healing business 🙂 Let me know if you go to Bali and try it! I’ve never heard of Jamu before but it looks and sounds completely amazing to me! I love fresh tumeric (especially in smoothies) and am a ginger addict (I’d go as far as to say that) so I’m sure I’d love it. Ya for sure you would love this!!! Hi, I would love to try the other variations of the Jamu recipe that you mentioned. Would you please be able to add them as well? Jamu came from ancient javanese royal family daily beverage and medicine recipes. Basicly,every plants can be added to make this healthy drinks..every single tribe in Indonesia has their own special “secret” recipe and it comes in very unique taste and health effect to your body..
the quantities of 1 cup tumeric and 1/4 cup ginger grated, or before grating?